Generally when we think about “fixing” a smile, getting braces for crooked teeth is what comes to mind. Although this can certainly be what’s needed in some cases, especially for adolescents, often adults have more of a problem with cracked teeth, broken teeth, missing teeth, or teeth that are badly decayed. In these cases, a Smile Makeover is the recommended course of action to restore the smile to its former beauty and strength. A Smile Makeover can consist of several steps in various combinations, depending on what is needed for the individual patient. Porcelain crowns, for example, can help to repair broken and cracked teeth, fitting over the existing tooth to protect it and cover the damaged areas. Modern crowns look like natural teeth, without the dark metal line at the gum line that was typical of older-style crowns. With regular care, porcelain crowns can last many years. For those who have more extensive damage or missing teeth, there are several options. Dental bridges, or fixed dentures, are small groups of dentures that are fixed to neigboring teeth, thereby filling a gap that shouldn’t be there. Dental bridges are permanent, and can last five years or even longer. Traditional dentures are a more familiar option, but today’s dentures are not like those of decades past. Modern dentures fit more comfortably and snugly, and are easier to wear overall. A full set of dentures can be made to look like a full set of natural teeth, helping the patient to return to normal life as soon as possible. Sometimes though, for those who need extensive repairs, dental implants are the best option. Implants represent the state-of-the-art dentistry, and are permanently anchored into the jaw, just like real teeth. 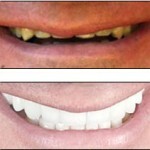 This gives a natural, comfortable, and durable smile, without any of the hassle associated with removable dentures. There are no adhesives to deal with, and no sore gums. The implants act much as natural teeth would. Dental implants can be used to replace a single tooth, a group of teeth, or an entire set of teeth. If your smile needs a makeover, contact us to make an appointment for a consultation. Learning what your options are is the first step; Dr. Rye can then help you make a decision for the best way to move toward getting your perfect smile.